★EYES: Aids in Skin Resistance Against the Appearance Fine Lines, Wrinkles & Crow Feet. Lifts & Contours The Eye Area. Supports Collagen Production For a Firmer & Smoother Skin. Calms the Skin & Relieves Puffiness. ★SKIN: Natural Glowing and Tone Skin. Moisturizes Skin & Repair & Heal Scars. Visibly Improves Tone & Clarity. ★INSTANTLY Reduces Roughness and Dryness and Enhances Your Skin Hydration For a Fresh and Balanced Feel. REVERSES signs of aging such as skin hyper-pigmentation and Uneven Tone Skin. ★MARINE COLLAGEN: Our Collagen Have The Most "Powerful Anti-Aging Amino Acids" Which Are Very Low Molecular Weight, Therefore Is Very Easily Absorbed By The Skin; Has The Power To Repair Damaged Skin; Improves Elasticity and Hydration; Provides You A Supple Skin; Boost Collagen Production. 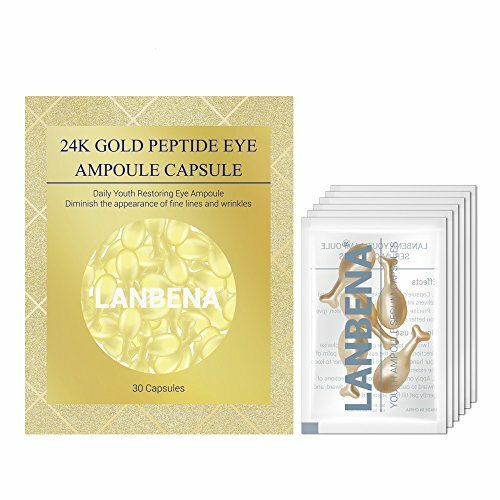 ★Manufacturer's Guarantee - Come with 3-Months guarantee, if for any reason you decide that this eye ampis not a good fit for your skin, please feel free to contact us for a 100% money-back refund. If you have any questions about this product by LANBENA, contact us by completing and submitting the form below. If you are looking for a specif part number, please include it with your message.